Europe Undivided analyzes how an enlarging EU has facilitated a convergence toward liberal democracy among credible future members of the EU in Central and Eastern Europe. It reveals how variations in domestic competition put democratizing states on different political trajectories after 1989, and how the EU's leverage eventually influenced domestic politics in liberal and particularly illiberal democracies. 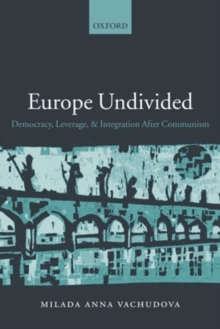 In doing so, Europe Undividedilluminates the changing dynamics of the relationship between the EU and candidate states from 1989 to 2004, and challenges policymakers to manage and improve EU leverage to support democracy, ethnic tolerance, and economic reform in other candidates and proto-candidates such as the Western Balkan states, Turkey, and Ukraine. Albeit not by design, the most powerful and successful tool of EU foreign policy has turned out to be EU enlargement - and this book helps us understand why, and how, it works.